Definition at line 32 of file transam.h. Referenced by GetNewTransactionId(), and TransactionLogFetch(). Definition at line 47 of file transam.h. Referenced by AdvanceNextFullTransactionIdPastXid(), load_xid_epoch(), main(), pg_control_checkpoint(), PrintControlValues(), PrintNewControlValues(), TransactionIdInRecentPast(), xlog_desc(), and XLogWalRcvSendHSFeedback(). Definition at line 140 of file transam.h. Referenced by BootStrapXLOG(), GetNewObjectId(), GuessControlValues(), PredicateLockingNeededForRelation(), record_plan_function_dependency(), and record_plan_type_dependency(). Definition at line 139 of file transam.h. Definition at line 141 of file transam.h. Referenced by binary_upgrade_set_type_oids_by_type_oid(), check_enable_rls(), get_loadable_libraries(), get_rel_infos(), GetNewObjectId(), is_publishable_class(), IsCatalogClass(), json_categorize_type(), jsonb_categorize_type(), logicalrep_typmap_gettypname(), main(), maybe_send_schema(), and ReindexMultipleTables(). Definition at line 34 of file transam.h. Referenced by BootStrapXLOG(), CLOGPagePrecedes(), CommitTsPagePrecedes(), do_start_worker(), ExtendCLOG(), ExtendCommitTs(), ExtendSUBTRANS(), FullTransactionIdAdvance(), GetOldestXmin(), GetSnapshotData(), GuessControlValues(), main(), relation_needs_vacanalyze(), SetTransactionIdLimit(), SubTransPagePrecedes(), and vacuum_set_xid_limits(). Definition at line 33 of file transam.h. Referenced by fill_seq_with_data(), heap_execute_freeze_tuple(), heap_prepare_freeze_tuple(), and TransactionLogFetch(). Definition at line 51 of file transam.h. Referenced by AbortSubTransaction(), AssignTransactionId(), CommitSubTransaction(), EstimateTransactionStateSpace(), GetCurrentFullTransactionId(), GetCurrentTransactionId(), GetTopFullTransactionId(), GetTopTransactionId(), MarkCurrentTransactionIdLoggedIfAny(), ProcArrayApplyRecoveryInfo(), SerializeTransactionState(), StartTransaction(), and TransactionIdIsCurrentTransactionId(). Definition at line 50 of file transam.h. Definition at line 52 of file transam.h. Referenced by CleanupTransaction(), CommitTransaction(), PrepareTransaction(), PushTransaction(), and StartTransaction(). Definition at line 31 of file transam.h. Referenced by _bt_cachemetadata(), _bt_check_unique(), _bt_delitems_delete(), _bt_getroot(), _bt_initmetapage(), _bt_upgrademetapage(), AbortTransaction(), ActivateCommitTs(), AdvanceOldestCommitTsXid(), AlterSequence(), apply_returning_filter(), asyncQueueAddEntries(), asyncQueueReadAllNotifications(), BackendIdGetTransactionIds(), BackendXidGetPid(), BootStrapXLOG(), btvacuumscan(), BuildCachedPlan(), CheckForSerializableConflictOut(), collect_corrupt_items(), CommitTransaction(), CommitTsShmemInit(), compute_new_xmax_infomask(), CreateCheckPoint(), CreateDecodingContext(), CreateInitDecodingContext(), CreateSharedProcArray(), DeactivateCommitTs(), DefineIndex(), DefineQueryRewrite(), do_analyze_rel(), ExpireAllKnownAssignedTransactionIds(), fill_seq_with_data(), FreezeMultiXactId(), GetOldestXmin(), GetSerializableTransactionSnapshotInt(), GetSnapshotData(), GetStableLatestTransactionId(), gistprunepage(), GuessControlValues(), heap_abort_speculative(), heap_compute_xid_horizon_for_tuples(), heap_create(), heap_execute_freeze_tuple(), heap_get_latest_tid(), heap_get_root_tuples(), heap_hot_search_buffer(), heap_lock_updated_tuple_rec(), heap_page_is_all_visible(), heap_page_prune(), heap_page_prune_opt(), heap_prepare_freeze_tuple(), heap_prune_chain(), heap_update(), heap_vacuum_rel(), heap_xlog_delete(), heapam_index_build_range_scan(), HeapTupleSatisfiesDirty(), HeapTupleSatisfiesMVCC(), HeapTupleSatisfiesSelf(), HeapTupleSatisfiesToast(), HeapTupleSatisfiesUpdate(), HeapTupleSatisfiesVacuum(), ImportSnapshot(), index_compute_xid_horizon_for_tuples(), index_create(), index_drop(), index_set_state_flags(), InitAuxiliaryProcess(), InitPredicateLocks(), InitProcess(), KnownAssignedXidsGet(), KnownAssignedXidsGetOldestXmin(), lazy_cleanup_index(), lazy_scan_heap(), logical_begin_heap_rewrite(), LogicalConfirmReceivedLocation(), main(), make_tuple_from_result_row(), MarkAsPreparingGuts(), message_cb_wrapper(), MinimumActiveBackends(), MultiXactIdGetUpdateXid(), OldSerXidInit(), OldSerXidSetActiveSerXmin(), pg_get_replication_slots(), PhysicalReplicationSlotNewXmin(), predicatelock_twophase_recover(), ProcArrayApplyRecoveryInfo(), ProcArrayApplyXidAssignment(), ProcArrayClearTransaction(), ProcArrayEndTransaction(), ProcArrayEndTransactionInternal(), ProcessStandbyHSFeedbackMessage(), read_seq_tuple(), RecordTransactionAbort(), RecordTransactionCommit(), recoveryStopsAfter(), recoveryStopsBefore(), RegisterPredicateLockingXid(), RelationSetNewRelfilenode(), ReleaseOneSerializableXact(), RemoveProcFromArray(), ReorderBufferAllocate(), ReorderBufferCommit(), ReorderBufferGetOldestXmin(), ReorderBufferProcessXid(), ReorderBufferQueueMessage(), ReorderBufferReturnTXN(), ReplicationSlotCreate(), ReplicationSlotRelease(), ReplicationSlotsComputeRequiredXmin(), ResetSequence(), ResolveRecoveryConflictWithTablespace(), RestoreSlotFromDisk(), set_status_by_pages(), SetCommitTsLimit(), SetNewSxactGlobalXmin(), SimpleLruFlush(), SlruInternalWritePage(), SnapBuildFindSnapshot(), SnapBuildProcessRunningXacts(), SnapMgrInit(), SnapshotResetXmin(), spgFormDeadTuple(), SubTransGetParent(), SubTransSetParent(), swap_relation_files(), TwoPhaseGetGXact(), txid_current_if_assigned(), UpdateXmaxHintBits(), vacuumRedirectAndPlaceholder(), WriteEmptyXLOG(), and XLogWalRcvSendHSFeedback(). Definition at line 35 of file transam.h. Referenced by SetTransactionIdLimit(), and StartupSUBTRANS(). Definition at line 103 of file transam.h. Referenced by SnapBuildCommitTxn(), and TransactionIdLimitedForOldSnapshots(). Definition at line 98 of file transam.h. Referenced by GetOldestXmin(), GetSnapshotData(), SnapBuildFindSnapshot(), SnapBuildInitialSnapshot(), and SnapBuildPurgeCommittedTxn(). Definition at line 45 of file transam.h. Definition at line 75 of file transam.h. Referenced by AdvanceNextFullTransactionIdPastXid(), GetOldestXmin(), GetSnapshotData(), KnownAssignedXidsAdd(), ProcArrayApplyRecoveryInfo(), RecordKnownAssignedTransactionIds(), SnapBuildCommitTxn(), and SnapBuildInitialSnapshot(). Definition at line 43 of file transam.h. Referenced by CheckCachedPlan(), CheckForSerializableConflictOut(), ConditionalXactLockTableWait(), ExtendCLOG(), ExtendCommitTs(), ExtendSUBTRANS(), FinishPreparedTransaction(), GetSerializableTransactionSnapshotInt(), heap_delete(), heap_get_latest_tid(), heap_get_root_tuples(), heap_hot_search_buffer(), heap_lock_tuple(), heap_lock_updated_tuple_rec(), heap_prune_chain(), heap_update(), heapam_tuple_lock(), logical_rewrite_heap_tuple(), MultiXactIdCreate(), MultiXactIdExpand(), predicatelock_twophase_recover(), PredicateLockTuple(), ProcArrayApplyRecoveryInfo(), ProcessTwoPhaseBuffer(), RecoverPreparedTransactions(), ReleasePredicateLocks(), SetNewSxactGlobalXmin(), StandbyTransactionIdIsPrepared(), TransactionIdGetCommitLSN(), TransactionIdIsActive(), TransactionIdIsCurrentTransactionId(), TransactionIdIsInProgress(), TransactionIdIsKnownCompleted(), TransactionLogFetch(), UpdateXmaxHintBits(), XactLockTableWait(), XidCacheRemoveRunningXids(), xideq(), XidInMVCCSnapshot(), XidIsConcurrent(), and xidneq(). Definition at line 42 of file transam.h. Referenced by BuildCachedPlan(), convert_xid(), ForceTransactionIdLimitUpdate(), GetOldestActiveTransactionId(), GetOldestSafeDecodingTransactionId(), GetOldestXmin(), GetRunningTransactionData(), GetSnapshotData(), heap_prepare_freeze_tuple(), heap_prune_record_prunable(), heap_tuple_needs_eventual_freeze(), heap_tuple_needs_freeze(), heap_vacuum_rel(), ImportSnapshot(), logical_rewrite_heap_tuple(), MaintainOldSnapshotTimeMapping(), pg_last_committed_xact(), PhysicalReplicationSlotNewXmin(), ProcArrayApplyRecoveryInfo(), ProcArrayInitRecovery(), ProcArrayInstallImportedXmin(), ProcArrayInstallRestoredXmin(), ProcessStandbyHSFeedbackMessage(), relation_needs_vacanalyze(), SetTransactionIdLimit(), SnapBuildBuildSnapshot(), SnapBuildFindSnapshot(), SnapBuildPurgeCommittedTxn(), StartupXLOG(), SubTransGetParent(), swap_relation_files(), TransactionIdFollows(), TransactionIdFollowsOrEquals(), TransactionIdGetCommitLSN(), TransactionIdGetCommitTsData(), TransactionIdInRecentPast(), TransactionIdIsCurrentTransactionId(), TransactionIdLimitedForOldSnapshots(), TransactionIdPrecedes(), TransactionIdPrecedesOrEquals(), TransactionIdSetCommitTs(), TransactionLogFetch(), vac_truncate_clog(), vac_update_datfrozenxid(), vac_update_relstats(), vacuum_set_xid_limits(), xid_age(), and xlog_redo(). Definition at line 41 of file transam.h. Referenced by _bt_check_unique(), _bt_doinsert(), _bt_vacuum_needs_cleanup(), AssignTransactionId(), bt_check_every_level(), btvacuumpage(), check_exclusion_or_unique_constraint(), CheckCachedPlan(), CheckForSerializableConflictOut(), CheckPointPredicate(), CheckTableForSerializableConflictIn(), ClearOldPredicateLocks(), ConditionalXactLockTableWait(), copy_table_data(), DecodeHeapOp(), DecodeXactOp(), DropAllPredicateLocksFromTable(), ExportSnapshot(), ForceTransactionIdLimitUpdate(), FreezeMultiXactId(), GetConflictingVirtualXIDs(), GetCurrentVirtualXIDs(), GetMultiXactIdMembers(), GetOldestSafeDecodingTransactionId(), GetOldestXmin(), GetRunningTransactionData(), GetRunningTransactionLocks(), GetSerializableTransactionSnapshotInt(), GetSnapshotData(), GetStableLatestTransactionId(), heap_abort_speculative(), heap_get_latest_tid(), heap_get_root_tuples(), heap_hot_search_buffer(), heap_lock_updated_tuple_rec(), heap_page_prune_opt(), heap_prepare_freeze_tuple(), heap_prune_chain(), heap_prune_record_prunable(), heap_update(), heap_xlog_clean(), heapam_index_build_range_scan(), heapam_tuple_lock(), HeapTupleHeaderIsOnlyLocked(), HeapTupleSatisfiesDirty(), HeapTupleSatisfiesMVCC(), HeapTupleSatisfiesSelf(), HeapTupleSatisfiesToast(), HeapTupleSatisfiesUpdate(), HeapTupleSatisfiesVacuum(), index_getnext_tid(), KnownAssignedXidExists(), KnownAssignedXidsGetAndSetXmin(), KnownAssignedXidsRemove(), KnownAssignedXidsRemovePreceding(), KnownAssignedXidsRemoveTree(), LogicalConfirmReceivedLocation(), MultiXactIdCreate(), MultiXactIdExpand(), OldSerXidAdd(), OldSerXidGetMinConflictCommitSeqNo(), OldSerXidSetActiveSerXmin(), pg_stat_get_activity(), predicatelock_twophase_recover(), PredicateLockPageSplit(), PredicateLockTuple(), ProcArrayApplyRecoveryInfo(), ProcArrayEndTransaction(), ProcArrayGroupClearXid(), ProcArrayRemove(), RecordKnownAssignedTransactionIds(), RecordTransactionAbort(), RecordTransactionCommit(), RegisterPredicateLockingXid(), RelationFindReplTupleByIndex(), RelationFindReplTupleSeq(), ReorderBufferTXNByXid(), ReplicationSlotRelease(), ReplicationSlotsComputeRequiredXmin(), ResolveRecoveryConflictWithSnapshot(), SetHintBits(), SetNewSxactGlobalXmin(), SnapBuildAddCommittedTxn(), SnapBuildCommitTxn(), SnapBuildDistributeNewCatalogSnapshot(), SnapBuildInitialSnapshot(), SpeculativeInsertionWait(), spgFormDeadTuple(), spgRedoVacuumRedirect(), StandbyAcquireAccessExclusiveLock(), StandbyReleaseLocks(), StandbyReleaseOldLocks(), StandbyTransactionIdIsPrepared(), StartupXLOG(), SubTransGetTopmostTransaction(), SubTransSetParent(), SummarizeOldestCommittedSxact(), swap_relation_files(), TransactionGroupUpdateXidStatus(), TransactionIdDidAbort(), TransactionIdDidCommit(), TransactionIdGetCommitTsData(), TransactionIdInRecentPast(), TransactionIdIsActive(), TransactionIdIsInProgress(), TransactionIdSetPageStatusInternal(), txid_status(), vac_update_datfrozenxid(), vacuum_log_cleanup_info(), vacuumRedirectAndPlaceholder(), xact_desc_abort(), xact_desc_commit(), xact_redo_abort(), xact_redo_commit(), XactLockTableWait(), XactLogAbortRecord(), XactLogCommitRecord(), XidCacheRemoveRunningXids(), XidIsConcurrent(), and XLogWalRcvSendHSFeedback(). Definition at line 92 of file transam.h. Referenced by heap_xlog_freeze_page(), ProcArrayApplyRecoveryInfo(), ProcArrayInitRecovery(), StartupXLOG(), TruncateSUBTRANS(), and xlog_redo(). Definition at line 44 of file transam.h. Definition at line 49 of file transam.h. Referenced by StartupXLOG(), and TransactionIdInRecentPast(). Definition at line 48 of file transam.h. Referenced by ActivateCommitTs(), AdvanceNextFullTransactionIdPastXid(), AssignTransactionId(), AtSubCommit_childXids(), CommitSubTransaction(), ForceTransactionIdLimitUpdate(), FullTransactionIdAdvance(), GetCurrentTransactionId(), GetCurrentTransactionIdIfAny(), GetNewTransactionId(), GetOldestActiveTransactionId(), GetOldestSafeDecodingTransactionId(), GetRunningTransactionData(), GetTopTransactionId(), GetTopTransactionIdIfAny(), load_xid_epoch(), main(), pg_control_checkpoint(), PrescanPreparedTransactions(), PrintControlValues(), PrintNewControlValues(), ProcessTwoPhaseBuffer(), ReadNewTransactionId(), ReleasePredicateLocks(), SerializeTransactionState(), SetTransactionIdLimit(), ShowTransactionStateRec(), StartupCLOG(), StartupSUBTRANS(), StartupXLOG(), TransactionIdInRecentPast(), TransactionIdIsCurrentTransactionId(), TrimCLOG(), xlog_desc(), xlog_redo(), and XLogWalRcvSendHSFeedback(). Definition at line 192 of file transam.h. Definition at line 262 of file varsup.c. References AmStartupProcess, Assert, epoch, EpochFromFullTransactionId, FullTransactionIdFromEpochAndXid(), IsUnderPostmaster, LW_EXCLUSIVE, LWLockAcquire(), LWLockRelease(), VariableCacheData::nextFullXid, TransactionIdAdvance, TransactionIdFollowsOrEquals(), unlikely, and XidFromFullTransactionId. Referenced by multixact_redo(), ProcArrayApplyRecoveryInfo(), ProcessTwoPhaseBuffer(), RecordKnownAssignedTransactionIds(), StartupXLOG(), xact_redo_abort(), and xact_redo_commit(). 271 * other process can modify it. 286 * point in the WAL stream. Definition at line 313 of file varsup.c. References LW_EXCLUSIVE, LWLockAcquire(), LWLockRelease(), VariableCacheData::oldestClogXid, and TransactionIdPrecedes(). Referenced by BootStrapXLOG(), clog_redo(), StartupXLOG(), and TruncateCLOG(). Definition at line 471 of file varsup.c. References DATABASEOID, LW_SHARED, LWLockAcquire(), LWLockRelease(), VariableCacheData::nextFullXid, ObjectIdGetDatum, VariableCacheData::oldestXid, VariableCacheData::oldestXidDB, SearchSysCacheExists1, TransactionIdFollowsOrEquals(), TransactionIdIsNormal, TransactionIdIsValid, XidFromFullTransactionId, and VariableCacheData::xidVacLimit. Definition at line 84 of file transam.h. References FirstNormalTransactionId, FullTransactionId::value, and XidFromFullTransactionId. Definition at line 65 of file transam.h. Referenced by AdvanceNextFullTransactionIdPastXid(), BootStrapXLOG(), GetNewTransactionId(), GuessControlValues(), and main(). Definition at line 509 of file varsup.c. References elog, ERROR, FirstBootstrapObjectId, FirstNormalObjectId, IsPostmasterEnvironment, LW_EXCLUSIVE, LWLockAcquire(), LWLockRelease(), VariableCacheData::nextOid, VariableCacheData::oidCount, RecoveryInProgress(), VAR_OID_PREFETCH, and XLogPutNextOid(). Referenced by GetNewOidWithIndex(), and GetNewRelFileNode(). 523 * IsCatalogClass()). Note we are relying on unsigned comparison. 526 * we only wrap if before that point when in bootstrap or standalone mode. 531 * will never conflict with user-assigned OIDs. Definition at line 49 of file varsup.c. References Assert, BootstrapTransactionId, elog, ereport, errcode(), errhint(), errmsg(), ERROR, ExtendCLOG(), ExtendCommitTs(), ExtendSUBTRANS(), FullTransactionIdAdvance(), FullTransactionIdFromEpochAndXid(), get_database_name(), IsBootstrapProcessingMode, IsInParallelMode(), IsUnderPostmaster, LW_EXCLUSIVE, LWLockAcquire(), LWLockRelease(), MyPgXact, MyProc, VariableCacheData::nextFullXid, PGXACT::nxids, VariableCacheData::oldestXidDB, PGXACT::overflowed, pg_write_barrier, PGPROC_MAX_CACHED_SUBXIDS, PMSIGNAL_START_AUTOVAC_LAUNCHER, RecoveryInProgress(), SendPostmasterSignal(), PGPROC::subxids, TransactionIdFollowsOrEquals(), WARNING, PGXACT::xid, XidFromFullTransactionId, XidCache::xids, VariableCacheData::xidStopLimit, VariableCacheData::xidVacLimit, VariableCacheData::xidWarnLimit, and VariableCacheData::xidWrapLimit. 56 * operation, so we can't account for new XIDs after that point. 85 * If we're past xidVacLimit, start trying to force autovacuum cycles. 86 * If we're past xidWarnLimit, start issuing warnings. 89 * to the DBA who somehow got past the earlier defenses). 91 * Note that this coding also appears in GetNewMultiXactId. 101 * copy all the shared values we'll need in this path. 113 * plenty of chances before we get into real trouble. 129 errhint("Stop the postmaster and vacuum that database in single-user mode.\n"
136 errhint("Stop the postmaster and vacuum that database in single-user mode.\n"
149 errhint("To avoid a database shutdown, execute a database-wide VACUUM in that database.\n"
156 errhint("To avoid a database shutdown, execute a database-wide VACUUM in that database.\n"
171 * holds 32K or more transactions, so we don't have to do this very often. 173 * Extend pg_subtrans and pg_commit_ts too. 183 * assign more XIDs until there is CLOG space for them. 191 * correct OldestXmin tracking; see src/backend/access/transam/README. 196 * TransactionId and int fetch/store are atomic. 198 * The same comments apply to the subxact xid count and overflow fields. Definition at line 238 of file transam.h. Referenced by _bt_unlink_halfdead_page(), ActivateCommitTs(), AutoVacWorkerMain(), do_start_worker(), GetStableLatestTransactionId(), ginDeletePage(), gistdeletepage(), vac_truncate_clog(), vac_update_datfrozenxid(), vac_update_relstats(), and vacuum_set_xid_limits(). Definition at line 246 of file varsup.c. References LW_SHARED, LWLockAcquire(), LWLockRelease(), and VariableCacheData::nextFullXid. Referenced by load_xid_epoch(), ReadNewTransactionId(), TransactionIdInRecentPast(), and XLogWalRcvSendHSFeedback(). Definition at line 330 of file varsup.c. References Assert, autovacuum_freeze_max_age, DEBUG1, ereport, errhint(), errmsg(), FirstNormalTransactionId, get_database_name(), InRecovery, IsTransactionState(), IsUnderPostmaster, LW_EXCLUSIVE, LWLockAcquire(), LWLockRelease(), MaxTransactionId, VariableCacheData::nextFullXid, VariableCacheData::oldestXid, VariableCacheData::oldestXidDB, PMSIGNAL_START_AUTOVAC_LAUNCHER, SendPostmasterSignal(), TransactionIdFollowsOrEquals(), TransactionIdIsNormal, WARNING, XidFromFullTransactionId, VariableCacheData::xidStopLimit, VariableCacheData::xidVacLimit, VariableCacheData::xidWarnLimit, and VariableCacheData::xidWrapLimit. Referenced by BootStrapXLOG(), StartupXLOG(), vac_truncate_clog(), and xlog_redo(). 379 * to be more than autovacuum_freeze_max_age transactions old. 382 * so that xidVacLimit will be well before xidWarnLimit. 417 * another iteration immediately if there are still any old databases. 431 * must just report the oldest DB's OID. 435 * still warn, even though the warning might now be unnecessary. 447 errhint("To avoid a database shutdown, execute a database-wide VACUUM in that database.\n"
454 errhint("To avoid a database shutdown, execute a database-wide VACUUM in that database.\n"
Definition at line 290 of file transam.c. References InvalidXLogRecPtr, TRANSACTION_STATUS_ABORTED, and TransactionIdSetTreeStatus(). Referenced by RecordTransactionAbort(), RecordTransactionAbortPrepared(), and xact_redo_abort(). Definition at line 272 of file transam.c. Referenced by RecordTransactionCommit(), and xact_redo_commit(). Definition at line 260 of file transam.c. References InvalidXLogRecPtr, TRANSACTION_STATUS_COMMITTED, and TransactionIdSetTreeStatus(). Referenced by RecordTransactionCommit(), RecordTransactionCommitPrepared(), and xact_redo_commit(). Definition at line 181 of file transam.c. References elog, SubTransGetParent(), TRANSACTION_STATUS_ABORTED, TRANSACTION_STATUS_SUB_COMMITTED, TransactionIdDidAbort(), TransactionIdIsValid, TransactionIdPrecedes(), TransactionLogFetch(), TransactionXmin, and WARNING. Referenced by DoesMultiXactIdConflict(), heap_lock_updated_tuple_rec(), heap_update(), ProcArrayApplyRecoveryInfo(), ProcessTwoPhaseBuffer(), StandbyAcquireAccessExclusiveLock(), test_lockmode_for_conflict(), TransactionIdDidAbort(), TransactionIdIsInProgress(), and txid_status(). 188 * If it's marked aborted, it's aborted. 194 * If it's marked subcommitted, we have to check the parent recursively. 217 * It's not aborted. Definition at line 125 of file transam.c. 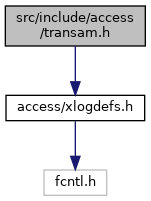 References elog, SubTransGetParent(), TRANSACTION_STATUS_COMMITTED, TRANSACTION_STATUS_SUB_COMMITTED, TransactionIdDidCommit(), TransactionIdIsValid, TransactionIdPrecedes(), TransactionLogFetch(), TransactionXmin, and WARNING. Referenced by asyncQueueProcessPageEntries(), check_safe_enum_use(), compute_new_xmax_infomask(), FreezeMultiXactId(), heap_prepare_freeze_tuple(), HeapTupleHeaderAdvanceLatestRemovedXid(), HeapTupleHeaderIsOnlyLocked(), HeapTupleSatisfiesDirty(), HeapTupleSatisfiesHistoricMVCC(), HeapTupleSatisfiesMVCC(), HeapTupleSatisfiesSelf(), HeapTupleSatisfiesToast(), HeapTupleSatisfiesUpdate(), HeapTupleSatisfiesVacuum(), MultiXactIdExpand(), ProcArrayApplyRecoveryInfo(), ProcessTwoPhaseBuffer(), RecordTransactionAbort(), RecordTransactionAbortPrepared(), StandbyAcquireAccessExclusiveLock(), test_lockmode_for_conflict(), TransactionIdDidCommit(), txid_status(), UpdateLogicalMappings(), and UpdateXmaxHintBits(). 132 * If it's marked committed, it's committed. 138 * If it's marked subcommitted, we have to check the parent recursively. 146 * knowledge in pg_subtrans of the transactions after TransactionXmin. 149 * seems reasonable to emit a WARNING for it. 168 * It's not committed. Definition at line 334 of file transam.c. Referenced by convert_xid(), GetConflictingVirtualXIDs(), GetSerializableTransactionSnapshotInt(), heap_page_is_all_visible(), HeapTupleHeaderAdvanceLatestRemovedXid(), lazy_scan_heap(), MaintainOldSnapshotTimeMapping(), OldSerXidAdd(), OldSerXidGetMinConflictCommitSeqNo(), OldSerXidSetActiveSerXmin(), predicatelock_twophase_recover(), ProcessTwoPhaseBuffer(), RecordKnownAssignedTransactionIds(), SnapBuildWaitSnapshot(), SubTransSetParent(), TransactionIdLimitedForOldSnapshots(), and xmin_cmp(). Definition at line 349 of file transam.c. Referenced by AdvanceNextFullTransactionIdPastXid(), CheckForSerializableConflictOut(), ForceTransactionIdLimitUpdate(), GetNewTransactionId(), HeapTupleSatisfiesHistoricMVCC(), KnownAssignedXidsAdd(), KnownAssignedXidsGetAndSetXmin(), KnownAssignedXidsRemovePreceding(), PredicateLockTuple(), ProcessTwoPhaseBuffer(), SetTransactionIdLimit(), SnapBuildCommitTxn(), SubTransGetParent(), SubTransGetTopmostTransaction(), vacuumLeafPage(), XidInMVCCSnapshot(), and XidIsConcurrent(). Definition at line 402 of file transam.c. References cachedCommitLSN, cachedFetchXid, InvalidXLogRecPtr, TransactionIdEquals, TransactionIdGetStatus(), and TransactionIdIsNormal. 410 * extra trip to shared memory. 420 * Get the transaction status. Definition at line 238 of file transam.c. Definition at line 365 of file transam.c. Referenced by FinishPreparedTransaction(), ProcArrayApplyXidAssignment(), RecordTransactionAbort(), RecordTransactionCommit(), xact_redo_abort(), and xact_redo_commit(). 375 * array back-to-front to avoid useless assignments. Definition at line 300 of file transam.c. Referenced by _bt_page_recyclable(), _bt_vacuum_needs_cleanup(), AdvanceOldestClogXid(), AdvanceOldestCommitTsXid(), bt_check_every_level(), btvacuumpage(), check_exclusion_or_unique_constraint(), CheckForSerializableConflictOut(), CheckTargetForConflictsIn(), CLOGPagePrecedes(), collect_corrupt_items(), CommitTsPagePrecedes(), convert_xid(), copy_table_data(), do_start_worker(), ExpireTreeKnownAssignedTransactionIds(), ExportSnapshot(), FreezeMultiXactId(), get_relation_info(), GetOldestActiveTransactionId(), GetOldestSafeDecodingTransactionId(), GetOldestXmin(), GetRunningTransactionData(), GetSnapshotData(), gistPageRecyclable(), heap_page_is_all_visible(), heap_prepare_freeze_tuple(), heap_prune_record_prunable(), heap_tuple_needs_freeze(), HeapTupleHeaderAdvanceLatestRemovedXid(), HeapTupleIsSurelyDead(), HeapTupleSatisfiesHistoricMVCC(), HeapTupleSatisfiesVacuum(), KnownAssignedXidsAdd(), KnownAssignedXidsGetAndSetXmin(), KnownAssignedXidsSearch(), lazy_scan_heap(), logical_rewrite_heap_tuple(), MaintainOldSnapshotTimeMapping(), multixact_redo(), OldSerXidGetMinConflictCommitSeqNo(), OldSerXidSetActiveSerXmin(), PhysicalReplicationSlotNewXmin(), PrescanPreparedTransactions(), ProcArrayApplyRecoveryInfo(), ProcArrayApplyXidAssignment(), ProcArrayEndTransactionInternal(), ProcArrayRemove(), ProcessStandbyHSFeedbackMessage(), RecordKnownAssignedTransactionIds(), relation_needs_vacanalyze(), ReorderBufferAbortOld(), ReplicationSlotsComputeRequiredXmin(), rewrite_heap_tuple(), SetCommitTsLimit(), SetNewSxactGlobalXmin(), SnapBuildCommitTxn(), SnapBuildProcessChange(), SnapBuildRestore(), SnapshotResetXmin(), StandbyReleaseOldLocks(), SubTransGetTopmostTransaction(), SubTransPagePrecedes(), TransactionIdDidAbort(), TransactionIdDidCommit(), TransactionIdGetCommitTsData(), TransactionIdInRecentPast(), TransactionIdIsActive(), TransactionIdIsCurrentTransactionId(), TransactionIdIsInProgress(), TransactionIdLatest(), TransactionIdLimitedForOldSnapshots(), TransactionTreeSetCommitTsData(), tuple_all_visible(), txid_status(), vac_truncate_clog(), vac_update_datfrozenxid(), vac_update_relstats(), vacuum_set_xid_limits(), vacuumRedirectAndPlaceholder(), XidCacheRemoveRunningXids(), XidInMVCCSnapshot(), XidIsConcurrent(), xlog_redo(), XLogWalRcvSendHSFeedback(), and xmin_cmp(). 304 * comparison. If both are normal, do a modulo-2^32 comparison. Definition at line 319 of file transam.c. Referenced by ClearOldPredicateLocks(), GetCurrentVirtualXIDs(), GetSnapshotData(), heap_vacuum_rel(), KnownAssignedXidsAdd(), LogicalIncreaseXminForSlot(), ProcArrayInstallImportedXmin(), ProcArrayInstallRestoredXmin(), SnapBuildFindSnapshot(), SnapBuildInitialSnapshot(), TransactionIdInRecentPast(), and TransactionIdIsInProgress(). Definition at line 953 of file xact.c. Definition at line 34 of file varsup.c. Referenced by ActivateCommitTs(), AdvanceOldestCommitTsXid(), BootStrapXLOG(), CreateCheckPoint(), DeactivateCommitTs(), ExpireTreeKnownAssignedTransactionIds(), GetOldestActiveTransactionId(), GetOldestSafeDecodingTransactionId(), GetOldestXmin(), GetRunningTransactionData(), GetSnapshotData(), InitShmemAllocation(), PostmasterMarkPIDForWorkerNotify(), PrescanPreparedTransactions(), ProcArrayApplyRecoveryInfo(), ProcArrayEndTransactionInternal(), ProcArrayRemove(), ProcessTwoPhaseBuffer(), ReleasePredicateLocks(), SetCommitTsLimit(), StartupCLOG(), StartupSUBTRANS(), StartupXLOG(), TransactionIdGetCommitTsData(), TransactionIdInRecentPast(), TransactionIdIsInProgress(), TransactionTreeSetCommitTsData(), TrimCLOG(), XidCacheRemoveRunningXids(), and xlog_redo().